If you'd prefer to watch a video tutorial on how to set your notifications, head this way! You can set NurseGrid to notify you about changes in your schedule through app notifications, emails, and text messages. To set up your notifications on iOS, tap the "Me" button on the bottom of your screen, then select "Profile" and scroll down to the Contact Information section. Here you'll be able to add a secondary email address (like your personal email address if your NurseGrid account is associated with your work email address) and mobile phone number. 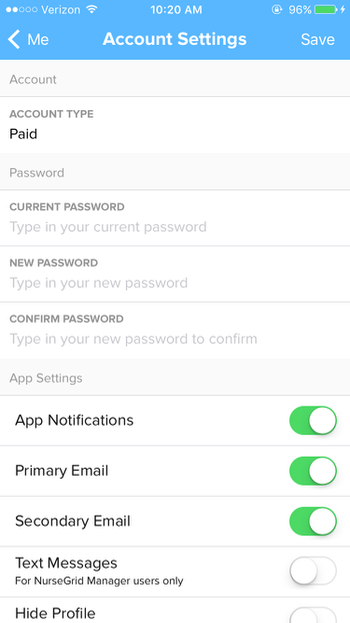 To receive notifications, make sure that the "App Notifications" toggle is switched on. Toggle on any of the remaining switches if you'd like to be notified at those email addresses. Heads up: text message notifications are only available for users in departments using NurseGrid Manager.